This Christmastime river cruise begins in Austria’s magical capital of Vienna, home to the sounds of Mozart and Strauss, the Vienna Boys’ Choir, and the Spanish Riding School. See the famous sights with a Local Guide, or opt to go on a culinary tour through the Christmas markets to get a taste of all the best flavors Austria offers during this time of year. 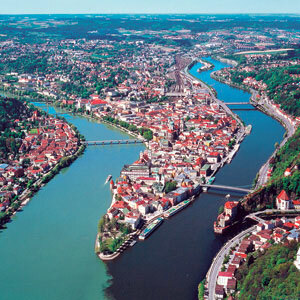 Cruise through the wintery landscape of the picturesque Wachau Valley to Melk. Here, you’ll tour the magnificent 11th century Benedictine Abbey-one of Europe’s largest monasteries-where monks still stroll amidst the sacred walls. 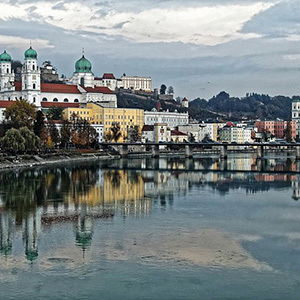 Arrive in Passau, Germany, and visit the city’s charming Christmas market set against the breathtaking backdrop of St. Stephen’s Cathedral, a masterpiece of baroque architecture. In Regensburg, after a guided tour of the city, savor traditional sausages at Historiche Wurstküche (Old Sausage Kitchen), one of Germany’s oldest restaurants and enjoy a tasting of German beers. Learn about Christmas traditions as you cruise to Nuremberg, the thousand-year-old city with its medieval fortifications and gothic churches. The Old Town is illuminated with festive lights and decorations, and the Christmas market has dozens of stalls offering traditional wares, such as Lebkuchen (spicy gingerbread) and unique decorations and ornaments. Then, make your way to Prague, the capital of the Czech Republic-one of Europe’s most beautiful cities.